Update: join our free webinar on translanguaging! I was recently invited to give a presentation in Amsterdam for about 150 teachers who teach Dutch as a second language. I decided to introduce the concept of ‘translanguaging’. To explain what translanguaging is, I asked the participants to do a math assignment intended for 4 to 6 year olds. The catch? 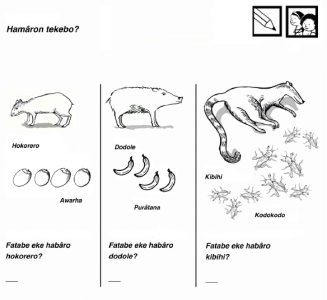 The instructions were given in Sranan (the lingua franca spoken in my native country Suriname), the exercises were written in three indigenous and maroon languages of Suriname (Kari’na, Lokono and Saamaka) with images drawn from the Suriname rainforest (see an example below). Image: Illustration from Maths, Naturally! – an open source bilingual math book developed with indigenous and maroon communities in Suriname. The goal of the exercise was to raise the teachers’ awareness of what it is like for children who speak a different language, who come from a different cultural background, to first enter school in a new country where everybody speaks a new language. But mainly I wanted to show the strategies that multilinguals use to complete an assignment in a language or cultural context they are unfamiliar with. One thing all the teachers did was: discussing the task with their partner in their home language (Dutch). They immediately started to help each other out to try and figure out the answer. Which is exactly what we want kids to do. Teachers should realize that if children are not allowed to talk to each other in their own language at school (which is the case in many Dutch and Belgian schools! ), you take away an important strategy that helps them to complete the task. A strategy that actually not only makes them feel comfortable in the classroom but also helps them to learn. Which is what school is all about…right? None of this is new, there is ample scientific research showing that children do better when their mother tongues are supported. A recent report published by the European Commission which aimed at identifying the most effective strategies for multilingual classrooms, pointed at mother tongue support as one of the key strategies, leading to improved skills in the school language and to greater confidence and a positive self-image of migrant children. What is interesting and innovative about translanguaging is a) that it doesn’t matter how many languages are spoken in the classroom, b) that teachers don’t need to have special language skills and c) that ALL children benefit, including Dutch speaking monolingual children. They learn how languages *work* and that improves their cognitive and social skills. This video by Nathalie Auger, Professor of Sociolinguistics at Université Paul-Valéry in Montpellier, is a wonderful example: a class of migrant children in France discuss complex grammatical concepts with the teacher, offering suggestions of how the concepts are applied in their own languages. It is time to have these conversations more often. With the new arrival of thousands of refugee children in the Netherlands, we better not make the same mistake as 40 years ago. I don’t believe we should go back to separate culture and language classes for Turkish or Moroccan immigrants with special teachers. Instead, we need to move forward and make use of the golden opportunity presented by this new multilingual generation of Syrian, Iraqi, Somali kids. They and their parents bring a wealth of knowledge that will actually help all of us. There are a number of books and articles about translanguaging. Translanguaging Practice Briefs for Educators provides an excellent introduction. Celic, C., & Seltzer, K. (2001). Translanguaging: A CUNY-NYSIEB guide for educators. New York, NY: City University of New York, Graduate Center. In partnership with Dr. Emmanuelle LePichon (Utrecht University) we have developed a pilot programme on translanguaging for schools in The Netherlands. Click on the link to find out more or contact us at info@rutufoundation.org.